That’s a pretty big claim, stating that no contractor — from Allentown to Kingston — can do a kitchen remodel better or faster than us. All I ask is that you reserve your judgment and let me prove it to you. Contrary to popular belief, a kitchen remodel is not as simple and as easy as they make it look on those DIY (Do It Yourself) reality TV shows. Sure, anybody can come in and slap on a “cosmetic” patch job and make it look great… but is it safe? Functional? Or more importantly – Will It Last? The reality is that there are hundreds of ways a kitchen remodel — whether it’s in Dunmore or Bethlehem — can go wrong. From the granite countertop being off by ½ an inch, to the flooring being ordered, to the cabinets being stained the wrong color – not to mention all of the electrical and plumbing behind the walls. When something goes wrong – contractors in PA have one of two choices. They can either do the right thing and fix the mistake – at the expense of materials, labor, time and resources – or they can hide the mistake, put a patch job on it, and hope you don’t discover it until after they are long gone. Given that so much of a kitchen remodel happens behind the walls where you can’t see it – who do you want to trust your remodel to? The point is there are a thousand things that have to go EXACTLY right to make a kitchen remodel not only beautiful – but safe, functional, and long-lasting. Sure, there are plenty of kitchen contractors from Allentown to Dallas that might say they are faster and cheaper than us. 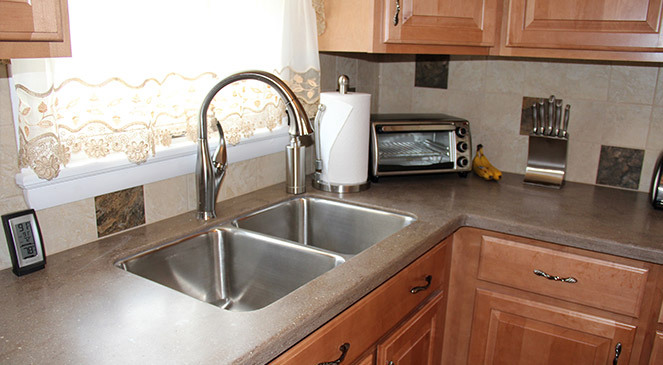 But if you want to know that your kitchen is going to get done EXACTLY right and that it will get done in as little as one week – with superior craftsmanship – then call us. We have mastered the science and art of remodeling kitchens. Meticulous planning, foresight, protocols, checklists, and inspections – that’s how we do it, and no one does it better or faster than us. When It Comes To A Remodel – The “Old-School” Way Of Doing Things Is ABSOLUTELY The Best Way. You’ll Know What We Are Doing And When – Every Step Of The Way. This Is Where It All Starts – Visit our showroom or we can come to you. Fast, Easy, Affordable. Get Your Dream Kitchen RIGHT NOW for affordable payments later.